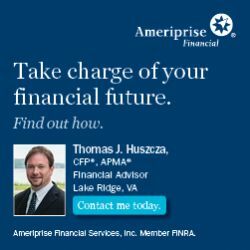 Ameriprise Financial Services, Inc. offers financial advisory services, investments, insurance and annuity products. RiverSourceSM and Columbia Management products are offered by affiliates of Ameriprise Financial Services, Inc., Member FINRA and SIPC. The purpose of NVYLL is to provide the youth residing within the geographical boundaries of northern Virginia a healthful, enjoyable leisure time activity and as a corollary to develop qualities that may help them in later life, sportsmanship, team play, and integrity. US Lacrosse Potomac is the governing body for lacrosse in the Virginia, Maryland, and Washington DC region. Web site for the Washington Area Lacrosse Officials Association (WALOA) - www.waloa.org. Site includes certification and training information, handouts, etc.